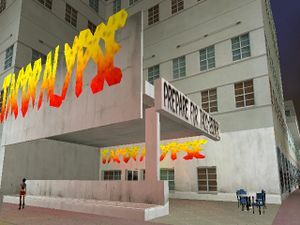 Tacopalypse is a taco shop in Downtown, Vice City in Grand Theft Auto: Vice City (set in 1986). It is located on the east side of the Hyman Condo. There are molotov cocktails under the roof. The shop's slogan is Prepare for taco-geddon!!. Its name is a portmanteau of Taco and Apocalypse. This page was last modified on 15 March 2017, at 15:50.